Introducing 'Treeda', a new model eco-car installed with a newly developed photosynthesis engine! An ecology-minded entertainment film depicting a bright future of 'cars' and 'families' in a light and humorous touch, all in 3DCG. The truck driver has 'special gift'. This, unknown by the world, is revealed in an encounter with a young French backpacker. This is a short PSA animation showing the effects of Global Warming. - What can I do? When a boy is seen drawing a white line across the walls in town, people dismiss it as a childish prank and goes on with their everyday lives. However the line is eventually drawn on everything, and it becomes clear that it is much more than just a prank. 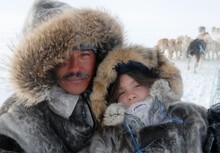 Two girls in Northern Greenland are travelling to a disappearing village where one of them still lives. Against a background of melting ice they discuss the pollution which is not only dramatically changing their lives but threatening the entire world. We all need to take action, each and every one of us, not just sound an alarm or highlight ecological issues. A young couple's impetuous week illustrates the simple things that can be done on a daily basis. Here's how we can 'Eco' everyday. Starring Ryo Kase and Yoko Maki.